What is it? Dungeons and Dragons goes to Europe to gain experience and culture, gets flirty, and 9 months later - we have Lords of Waterdeep. Welcome everybody to the city of Waterdeep, also known as the City of Splendors. A city run by secret rulers, who are each doing their best to become the ultimate Lord of Waterdeep, and by any means necessary. 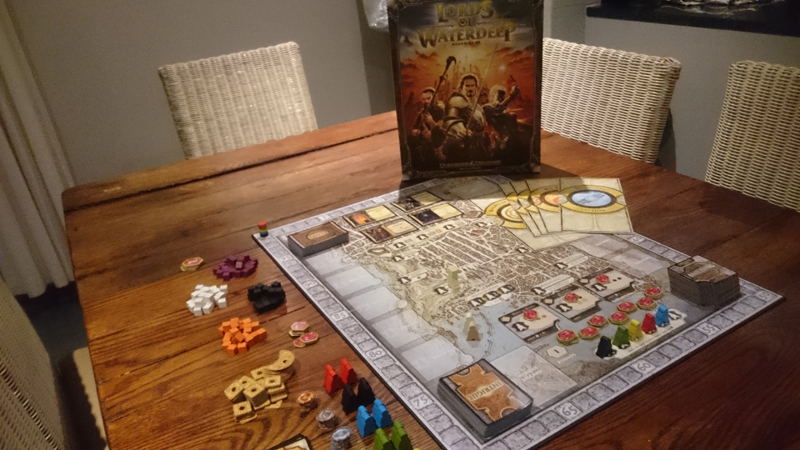 Lords of Waterdeep is a worker placement game set in the famous city of Waterdeep, from the Dungeons & Dragons campaign setting of Forgotten Realms. This game is the result of Wizards of the Coast taking (arguably) their best-known brand, removing its traditional RPG elements, and then of all things – creating a euro board game. Oh, and before somebody asks why I’m reviewing a 5-year old game when there are so many new titles (including some unplayed / unopened games on my shelf), I have to share that Lords of Waterdeep was the first game in my collection, and this past holiday I reconnected with it. It’s kinda special to me. 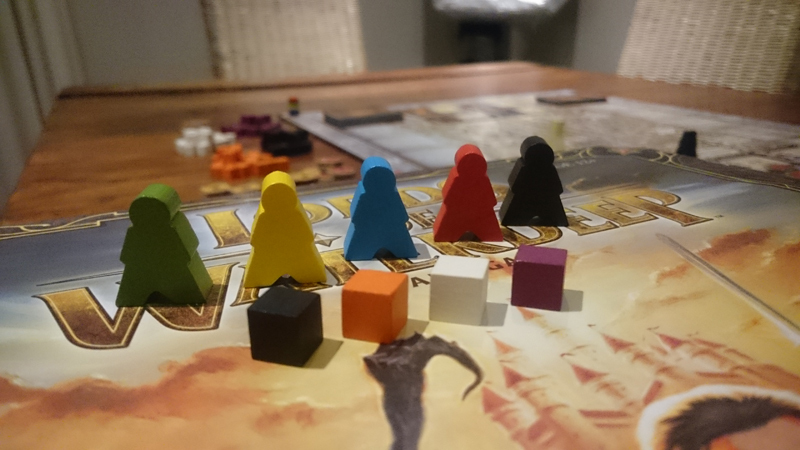 Just like its RPG origins, it does require a good imagination to play – such as imagining these “adventurers” (coloured) cubes are rogues, warriors, clerics and wizards (you’ll default to calling them “blocks” soon enough). Each player is randomly assigned one of the titular “Lord” roles. Now, a Lord does not dare dirty his hands by dealing directly with the scourge of Waterdeep to help them reach their goals, no, they send out their agents. These agents are placed at specific locations on the board to gain the resources (gold, real estate, or recruit adventurers like wizards, fighters, clerics, and rogues) you require to complete quests and then gain points. The Lord with the highest amount of points at the end of the game (after 8 rounds) is declared the ruler of Waterdeep. And probably also receives the key to the dungeons, which I assume becomes the new home to the other lords. Each “Lord” card grants a player bonus points at the end of the game for completing specific objections. While most of these bonuses are for completing specific types of quests (there are five types – such as Skullduggery and Arcana), some have different goals – such as investing in buildings. And you’ll also find that each quest type requires different resources, so each random role influences your strategy. The lord roles are not revealed until the end of the game when the scores are tallied. The board is split into many different areas, with the function of most spots pretty obvious. Gain two “fighters” (orange cubes) at the Field of Triumph. Or gain 4 gold at Aurora’s Realms Shop. There are also other areas – use abilities by playing “Intrigue” cards at Waterdeep Harbour, or invest in some lovely real estate at the Builder’s Hall. Cliffwatch Inn – Here is where you get to gain more quests, with each location giving you a choice of one of 4 quests to pick up, as well as something extra. Builder’s Hall – When you place an agent here, you can buy one of the three displayed buildings for the gold cost depicted on the tile you want, gain any victory tokens on said building, and you put the building in place as another location on the board. The building is marked with a cardboard token of your colour, and you will gain the rental reward if another agent is placed on your property. Waterdeep Harbour – This is where shenanigans occur. There are three locations in the harbour but each with the same reward – place one of your agents and play an “Intrigue” card. 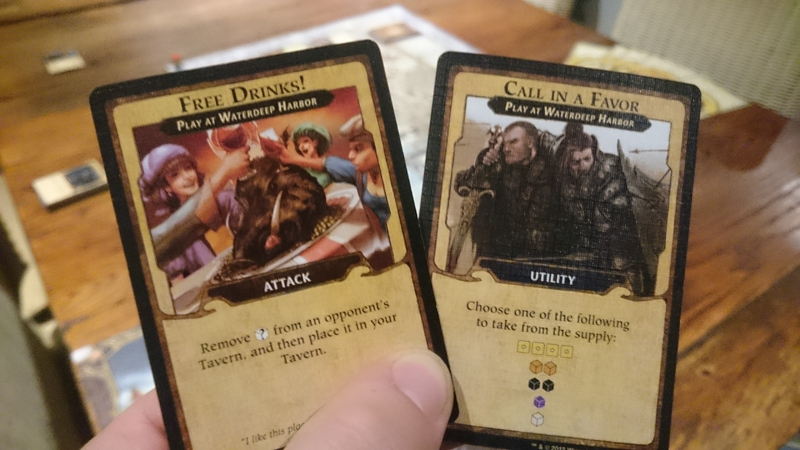 There is a large number of Intrigue cards, with many different outcomes, for example you can gain resources of your choice from the bank or from other players, or give an opponent a “Mandatory Quest”, a quest that must be finished before any others can be completed (possibly derailing their strategy). Castle Waterdeep – in addition to getting an Intrigue card, you also gain the Castle piece which makes you the first player for the next round. This becomes immensely valuable when playing with 4+ players and you find that the best resources are hard to gain when you’re playing last. Everybody picks a faction / colour and receives a player mat, and their agents (the number of agents you receive depends on how many players are involved). Note that at the start of round 5 you will receive an additional agent. Each player also gets a scoring marker and places it on the “0” position on the scoring track on the outskirt of the map board. The Intrigue deck, the Quest deck and the building stack is placed on their marked positions on the board. From the building stack, the top 3 buildings are drawn and placed face-up in the Builder’s Hall. Each player is then dealt a Lord card (House rule – deal two Lord cards to each player, and they choose one to keep). To not feel completely useless at the start, each player gets 2 quests cards (dealt face-up), 2 Intrigue cards (dealt face-down) and some gold (first player gets 4 gold, the next player gets 5, the next player 6 and so on). Now place 4 quests face-up in “Cliffwatch Inn” – these quests will be available to anybody that visits the Inn. On the Rounds track, place three victory point tokens on each space (numbered one to eight). At the start of each round, the three tokens are taken and one is placed on each building in the Builder’s Hall. If you buy a building, then you receive all the tokens stacked on that building, and your score is increased by how many tokens you received. The round’s victory tokens are placed on the buildings in the Builder’s hall, and the first player picks a location to place a single agent on, and gains the resources specified – adventurer cubes, money, quests or intrigue cards. On a turn a player can also check to see if they have the required resources to complete ONE quest. In clockwise order, everybody takes a turn to place an agent, until nobody has any agents left on their player card (or “inn”). If a player has an agent in the harbour, he / she must remove that agent and place it in any other available location (no other player can be located there). After all agents have been moved out of Waterdeep harbour (in the 1-2-3 sequence that they were placed in), all agents are returned to their Lords for the next round, and we’re ready to start the next round. As the game progresses, more locations will become available as players visit the Builder’s Hall and place more locations on the board (and is then marked as their property with a coloured token of their faction). With more locations available, getting resources becomes easier – until halfway through the game when everybody gains their extra agent and competition for the best locations goes up a notch or two. As you can see, each building has an “Owner” section marked at the bottom of each card. This is basically rental income if another player visits a location that you own. 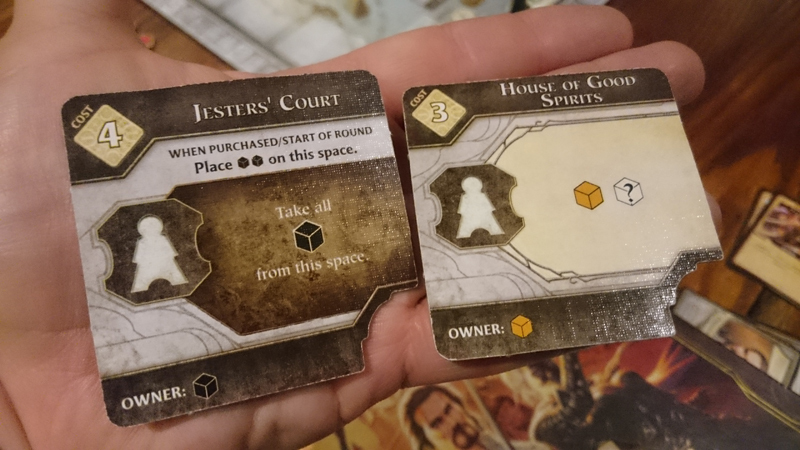 For example, if a player visits the “House of Good Spirits”, and receives his fighter cube and another of his choice, the owner of the building tile is entitled to one fighter cube. If you use one of your own locations on your turn, then you are not entitled to receive rental income. Warfare – orange adventurers, which like the rogues, are more easily attainable. As mentioned, each player can complete one quest per turn if they have the relevant resources. When a quest is completed, it is placed faced down on the player mat. There are also special quests called “Plot Quests”. When completed, they will have a ongoing effect if certain requirements are met. 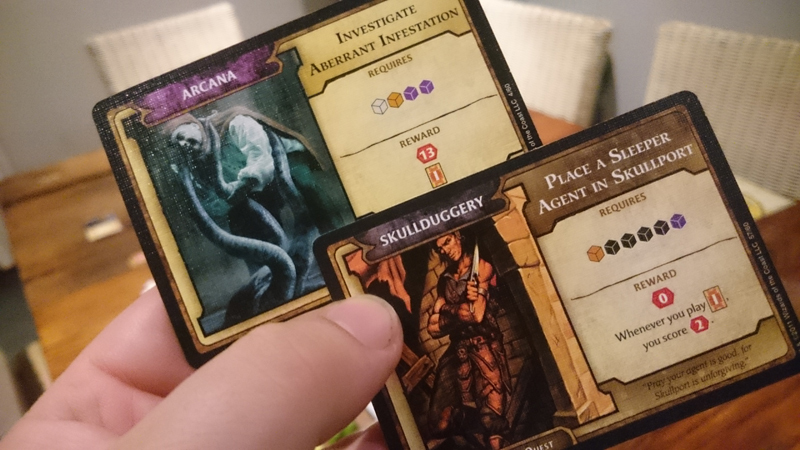 For example, in the image below the card “Place a Sleeper Agent in Skullport” states that every time you use an Intrigue card, you will receive 2 victory points. Intrigue cards are an interesting aspect. A player can go an entire game without venturing to the harbour and playing Intrigue cards, but there are some powerful cards to be used if you can get them. Generally, these cards will give you resources – either taken from the supply or from an opponent’s stash. The most annoying cards to play are the “Mandatory Quests” – small quests with a low amount of resources needed to complete them – these are given to opponents. A mandatory quest has to be completed first before you can finish any other quest. These can be quite disruptive to your overall strategy, especially towards the end of the game. The player with the highest score wins the game. In the event of a tie, the player with the most gold wins. And that is the game. Not terribly complex, and it takes about 2 rounds for a new player to get to grips with the basics. For this reason Waterdeep is probably the game I use the most to introduce new players to games. And this is not just because it’s easy to get into, it’s because it also looks impressively complex and slightly daunting to a newcomer. As I mentioned earlier, this was the first game I bought for my collection, and after setting it up for the first time I was blown away by the myriad of components and how splendid it looked all laid out. As a beginner back in the day I was quite satisfied when I grasped all of the mechanics of this sprawling setup. 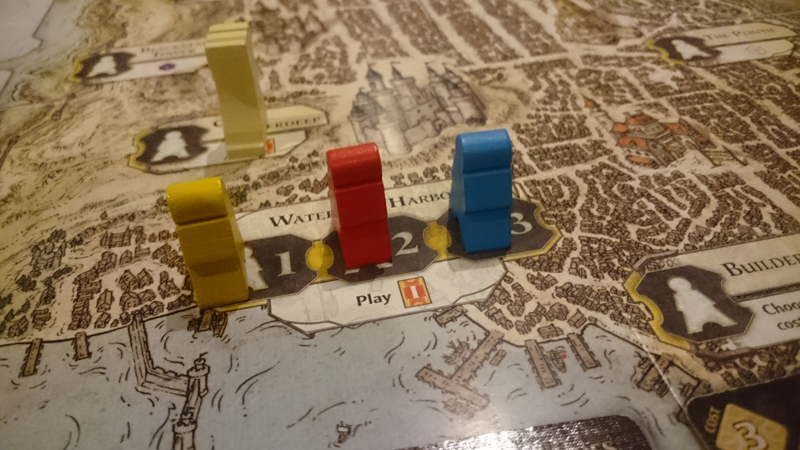 I started Waterdeep as a 2-player game, then expanded to 4 or 5 player games – it scales beautifully and even offers up a different experience with more players. 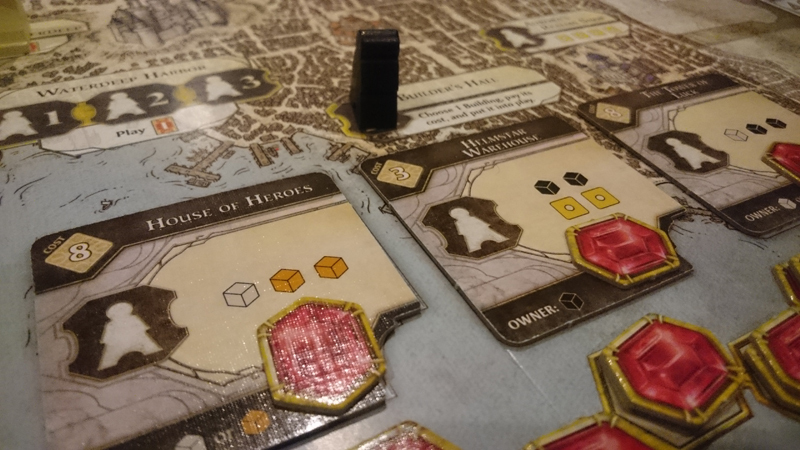 With more competition for the best resources, being the first player becomes crucial so visiting the Castle Waterdeep location to become the first player in the next round is recommended. Also with more players the game becomes more engaging because chances are somebody will pick your favoured location before you get a chance, so you end planning a few moves ahead and keeping an eye on everybody else’s move. I would like to give a special mention to Waterdeep’s box insert. It houses everything from the game perfectly, though never ever place the game on your shelf in an upright position – keep it flat or suffer the consequence of all the pieces getting muddled up. 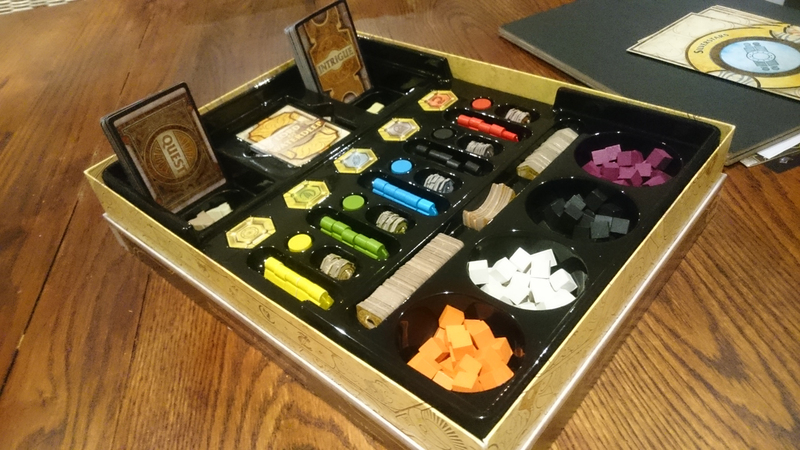 But it’s not all gravy with Waterdeep – while the game looks and plays well, there is a small problem with theme-implementation. Wizards decision to use wooden cubes as the adventurers doesn’t really inspire, and eventually everybody refers to them as “cubes” – instead of “clerics” or “wizards”. I’m also not the biggest fan of the mandatory quests, which can cause a bit of frustration between players. 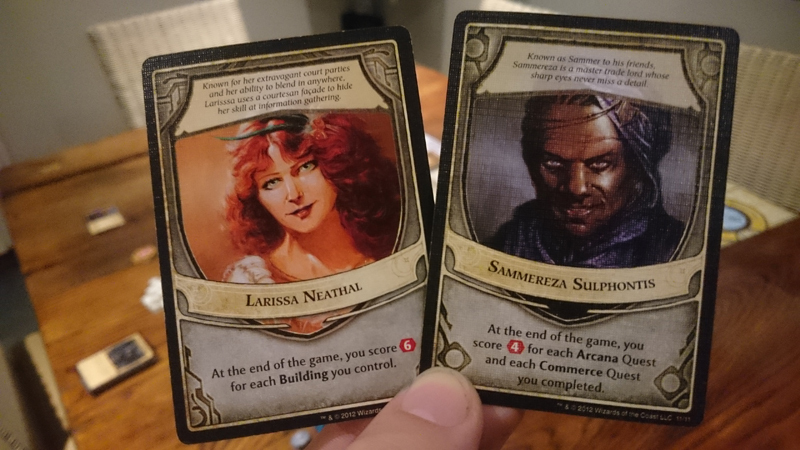 While Waterdeep throws up a decent challenge and good variety with its mechanics, the game really shines with the addition of the expansion, The Scoundrels of Skullport. It offers up new locations with different types of rewards, new quests and intrigue cards, a risk / reward mechanic (corruption) and it bumps the game up to 6 players. But I’ll delve into that another time. Game copy lovingly purchased by reviewer. I commend Wizards of the Coast for trying something different with their beloved roleplaying brand, the outcome is an excellent worker placement game that is engaging from start to finish. 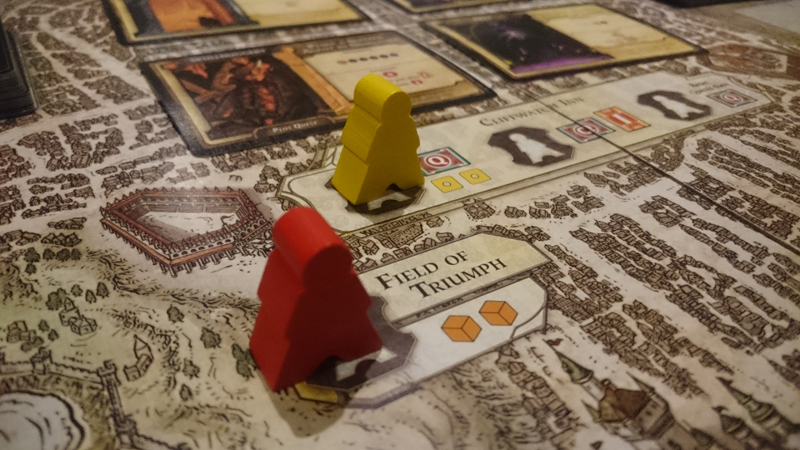 Lords of Waterdeep is my favourite gateway game and teaching tool, and still manages to offer me great experiences with whomever I show it off to. Fully recommended. CBQ's wannabe designer and (un)social media manager. A late convert to the board side of life (even though he was working in the industry for about 15 years). Wielder of the Zocchihedron.